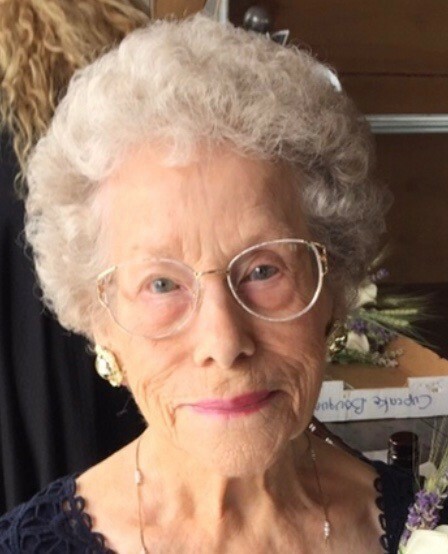 LYMAN, Phillis Dorothy Lindenbauer (Age 95) passed from her earthly life to be with our Lord on March 10, 2019. She was preceded in death on September 30, 2009, by her husband, Derald Ross Lyman, who she was married to for 61 years, and was the “most wonderful mother in the world” to her four children, Gayle Colman Burrell, Teresa J. (David) Herman, Debra C. (Norman) Gillies and Douglas W. (Ellen) Lyman. She was a loving and caring grandmother to 11 grandchildren and 10 great grandchildren. She was survived by her brother, Leo Lindenbauer, and sister, Bonnie Booth, and was a loving aunt to many nieces and nephews. She was also preceded in death by sisters, Lois Lyman, Mary Apitz, Betty Thompson and Clara Knight. Phillis lived a blessed life, tenderly caring for her family and sacrificially providing for their physical and emotional needs, always prayerful and steadfast in her faith, serving the Lord by serving others where ever God placed her. Phillis was born April 25, 1923, in Pasco, Washington, to Lester and Josephine Lindenbauer. She grew up in Spokane and graduated from Lewis and Clark High School. While riding the city bus to school, she met and started dating Derald. They continued seeing each other until he enlisted in the military and was sent overseas during World War II. After high school, she attended a local business college and began work as a secretary to a general at the U.S. Army Air Corps at Fort George Wright, where she met and married her first husband, William Wiechman, and began family life with daughter, Gayle, born in 1943. The family lived a military life during the war, being stationed in New Mexico and Colorado. As Phillis would be the first to say, the war took its toll on many marriages and families and resulted in her return to Spokane with Gayle. She married Derald on March 5, 1948, and continued to grow her family with the births of Teri in 1949, Debby in 1954 and Doug in 1958. Motherhood was her favorite occupation because she loved nurturing babies and children and all that went with their care, including cooking, baking, canning, wardrobe maintenance, and tending flower and vegetable gardens. She was a fastidious housekeeper and taught her children how to keep an orderly and welcoming home. She and Derald built their one and only home at W. 718 Mt. View Avenue in north Spokane where they lived for 54 years. Early in their marriage, they were encouraged by their neighbors to participate in a home Bible Study and as a result, became born again Christians and joined the Whitworth Community Presbyterian Church in 1950. For a brief time, she was a part-time church secretary at Whitworth under Reverend Vincent Carr. After all the children were in school, she went to work part-time in the customer service window at the Northtown Albertson’s Grocery Store and later, as secretary/receptionist at the district headquarters of the Spokane division of Albertson’s until 1985 when she retired. In addition to the joys of being a housewife, mother and grandmother, she enjoyed reading, writing stories and journals of her travels, dancing with Derald at the Eagles, maintaining her appearance with fashionable attire and jewelry (always “cute as a bugs ear”), clowning around in costume, playing cards and table games, traveling, fishing, camping, entertaining family and friends especially during the holidays, caring for her father-in-law, Grant Lyman, who lived with the family for seven years, and after her retirement, assisting with the care of her mother, Josephine Rowe. She was also involved in church life, singing in the choir, participating in Bible studies and adult Sunday school, and serving as a Jr. High Sunday school teacher, a Deacon, Women’s Association Circle member and prayer chain volunteer, and an avid Buccaneer in the Mariners couples social club. In 2005, she and Derald sold their home and moved to Fairwood Retirement Village where they enjoyed their many old and new friends. At Fairwood, she participated in various social activities including the Vesper service choir and Bible study groups and continued to nurture a garden plot and many beautiful flower pots on her patio. In November of 2013, she moved to the farmhouse in Enumclaw, WA, and enjoyed living with her daughter, Gayle, and brother, Leo, until she broke her hip in the summer of 2017, at which time it became necessary to move her to Lakeside Manor Adult Family Home where she received wonderful care until her passing. She was a prayer warrior for all of her family and encouraged everyone to trust in the Lord and lean on him. In all the many cards she wrote to her children and grandchildren, she always confirmed her love and God’s love for each of them. In spite of the physical pains she suffered as she grew older, she always had a positive outlook and sweet disposition, setting a wonderful example for her family who will miss her very much. She is now in the place she always wanted to be with her Savior, Jesus, and her sweetheart, “Deddy”. A Celebration of Life service will be held June 22, 2019 at 2:00 p.m. at the Whitworth Presbyterian Church. Memorial gifts may be made to the Union Gospel Mission for the benefit of Anna Ogden Hall, 1224 E. Trent Avenue, Spokane, WA 99202.